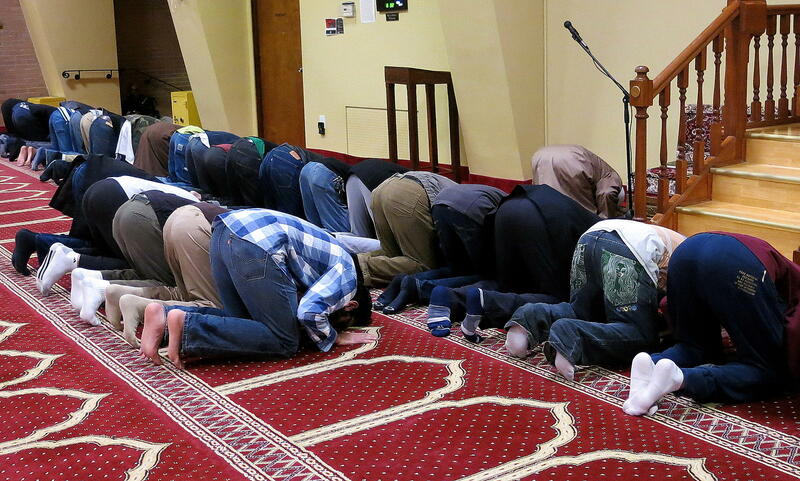 Prayer at the Islamic Center of Pittsburgh Saturday. It was followed by an announcement from Chief McLay that efforts are being taken to ensure the safety of the city's Muslim community. 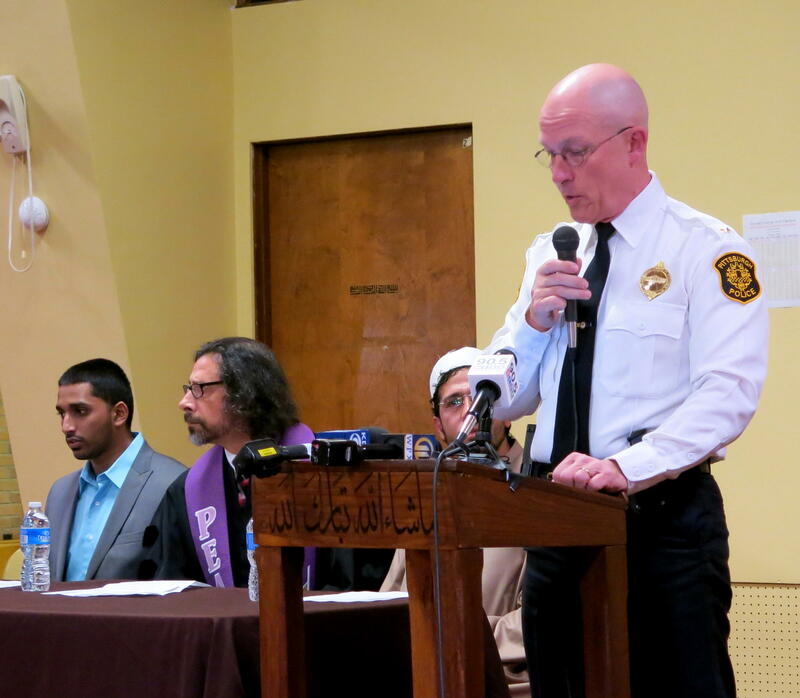 Following a call to prayer at the Islamic Center of Pittsburgh Saturday, the Pittsburgh Bureau of Police outlined a five-point plan to help protect the city’s Muslim community. “With increasing Islamophobia in America, it is very important that community leaders and local authorities both collaborate to be as proactive as possible in order to ensure the safety and well-being of the Muslim Community,” said Wasi Mohamed, executive director of the Islamic Center of Pittsburgh. This follows the Thanksgiving Day shooting of a Muslim taxi driver. The victim, whom police have not identified, is recovering at Mercy Hospital and said the man who shot him made remarks about ISIS and poked fun at the Prophet Muhammad. Wasi Mohamed maintains that this was a hate crime, though the incident is still under investigation and authorities have not labeled it as such. It took the police several days to arrest the alleged shooter, which led some in the Muslim community to believe the police weren’t making the case a priority. Police Chief Cameron McLay disagreed, saying it is a priority and he is proud of the work investigators did, but said communication does need to improve. “We have a great deal to accomplish yet in terms of improving trust between the Bureau of Police and the Muslim communities that we serve,” said McLay. "Actively combating hate and violence by consistently approaching all crimes of violence directed toward all members of communities of color with proactive efforts to detect and prosecute hate motivated crimes. Islamophobic or racially motivated violence has no place in our City. Developing and delivering cultural competency training to help investigators better understand the subtle cultural cues, and investigate issues related to the various cultures that comprise our Muslim communities. This training is in addition to the Police Bureau's existing training on procedural justice and implicit bias that is presently in development. Improving relationships and consistent lines of communication between Police Bureau officials and Muslim community leaders. Our goal is to increase mutual understanding and timely awareness of emergent issues for the concerns and safety of our Muslim neighbors. This communication plan will include points of contact at the Bureau, Zone command as well as the level of the Community Resource Officer, so community partners have multiple points of contact they can reach to for help in the Police Bureau. Working with a representative from the Mayor's staff and the Department of Public Safety who will also have liaison roles with the Islamic Center of Pittsburgh to help mediate issues of concern with our Muslim community. A commitment to the hiring and maintenance of a diverse police force as to be representative of the demographics of the city, which studies show leads to public safety." Police Chief Cameron McLay outlining collaboration agreement. Also pictured Wasi Mohamed, Executive Director of the Islamic Center of Pittsburgh (left) and Vincent Kolb with the Pennsylvania Interfaith Impact Network (PIIN). The Islamic Center’s Mohamed said the average Friday congregation size is about 750 people per prayer, the largest in the area. He said there are at least nine mosques that he knows of. In addition to the police and members of the Muslim community, members of the Pennsylvania Interfaith Impact Network (PIIN) were on hand to show their support. The Islamic Center of Pittsburgh has received numerous threats following the attacks in Paris, and several people in the congregation said that while they’ve never experienced violence in Pittsburgh, recent events have put them on edge. Pittsburgh Police Chief Cameron McLay stressed restraint to fellow officers in an internal memo distributed Wednesday that outlined a bureau review of firearms policies related to moving vehicles.